Tibet has always been the dreamland for mountaineers. Because it has many marvellous snow-covered mountains, including the world’s highest mountain, Mt. Everest and Namjagbarwa Peak, etc. Features: Mount Namjagbarwa (7,782) is the highest mountain in Nyingchi Prefecture, Tibet. 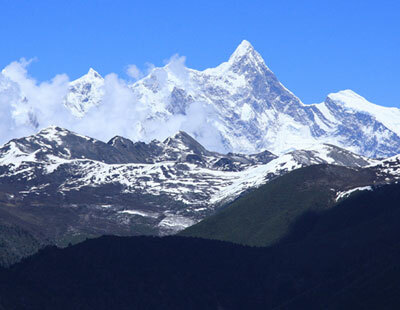 It ranks as world’s 15th highest peak. In Tibetan language, the mountain's name Namjagbarwa means ‘spear piercing into sky’. The mystique surrounding of this mountain attracts numerous mountaineers to explore this area every day. Except from the snow views, this mountain is also known as the nature museum. There are dark green alpine plants beneath the snow-line. There are a lot of glaciers around the valley, which belong to the marine glacier. Travellers and local Tibetan can enjoy a hot bath at the hot springs under the foot of the peak with marvellous views of glaciers and snow-capped mountains. Climbing history: Till 1980s, Chinese alpinists attempted the peak, but they failed to reach the summit. In 1990, a Chinese-Japanese expedition reconnoitred the peak. Furthermore, a third Chinese-Japanese expedition reach the summit on October 30, 1992. If you are interested in climbing the mountain, Namjagbarwa is definitely one of your best choices in Tibet. For more travel information, you can contact our local Tibet travel agency. Tips: Bring professional mountaineering equipment. Be well prepared both psychically and physically. It is better to hire a professional guide with you.